For me, Casio has always boasted their signature trend of the classic sleek gold digital wristwatch. Recognised by fashionistas all over, I was surprised to find an entire collection of bold and exciting designs on Discount Watch Store. Offering a bespoke range of mechanical elegance, the Casio Watch Collection is a harmonious blend of top-notch technology. With their revolutionary collection styled with global trends and expertly crafted, the Casio collection boasts aesthetic quality with an affordable price tag. Casio made its first calculator in 1957, but Casio watches was not unveiled until 1974 when they released the first digital watch with an automatic calender. The CASIOTRON reflected the Casio’s signature style, which is still displayed in their designs today. As the beginning of Casio’s dominance in the digital watch realm, the Casiotron was revolutionary in its functionality. Still sticking to their signature digital style, Casio’s blend of superior technology and visual appearance stems them away from other watch brands on the market. Using cutting edge craftsmanship, their impressive collection of watches ranges from a classic demure look to a contemporary style. Catching every vintage lovers eye, Casio watches have also be renowned for their quirky and hipster look. With an exclusive range that differs from other styles, Casio watches are made in Japan, blending innovation and accuracy as the two driving forces behind the creation of new designs. Another favourite feature of mine of the Casio collection, is their solar power functionality. The impact that we are having on the environment is always becoming an increasingly worrying factor, so changes I can make to improve my carbon foot print, I will. Casio offer the option to eliminate throwing away old batteries and instead investing in a high quality solar powered Casio watch that keeps on ticking for twenty to thirty years. Casio watches also feature radio-controlled technology, removing the worry of manually setting the time. The Casio collection automatically set the correct time, even when moving between time zones! If you love travelling or have a case of wanderlust, this is definitely something to look into. With so many designs and looks to choose from, it is difficult to pinpoint my favourite style. If I had to choose it would be the Casio Women’s Baby-G Ana-Digi White Resin Strap Watch. 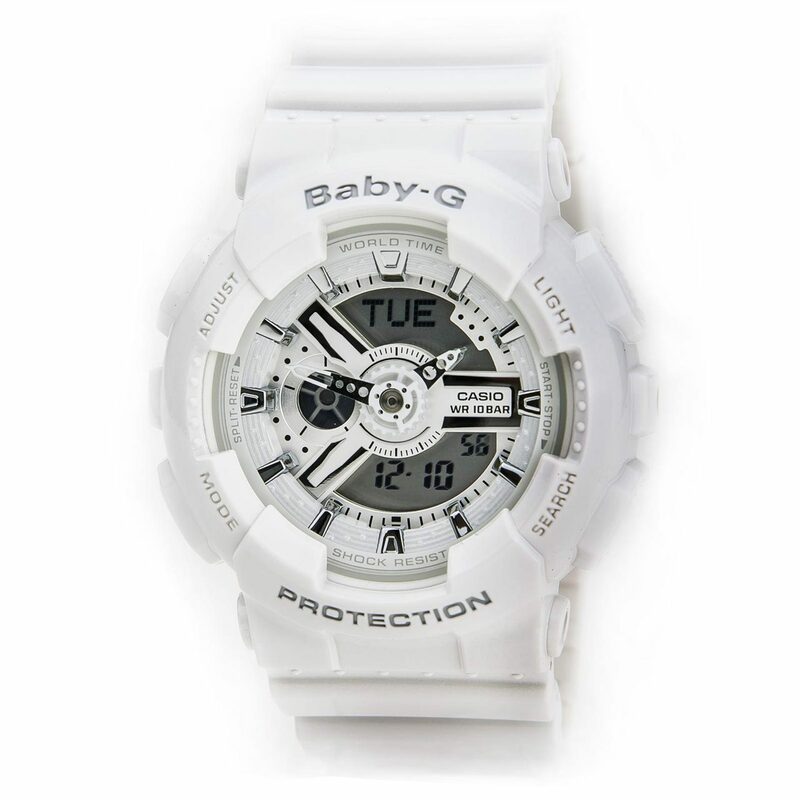 Remember when Baby G watches were all the rage? I’m loving them all over again at the moment. It’s both fun and quirky and up to 100 metres water resistant. I love wearing it as my everyday watch to add a little fun and character to my look. The Baby-G Casio range offer femininity and fun style that many of us young female fashionistas love! However, their other designs including the G-Shock and Pathfinder fit every watch niche and sure meet the classic Casio timepiece style. For the full Casio collection, head over to Discount Watch Store to find all the latest trends and styles to suit you.